July 2012 - Contemporary Controls recently qualified the Ethernet Interconnect Switch (EIS) series to comply with the requirements of Underwriters Laboratories (UL) 864 Control Units and Accessories for Fire Alarm Systems 9th Edition for Canada. The EIS already complied with the UL 864 requirements for the US. The new qualification means the EIS will carry the C-UL-US Component Recognition Mark that indicates compliance with both Canadian and U.S. requirements. UL 864 9th Edition governs the safety of fire alarm systems and equipment, including smoke detectors, sprinkler systems and fire alarms, and is used extensively throughout North America. "The EIS is unique to the building automation industry because it was built to comply with UL 864 9th Edition," said George Karones, Operations Manager. "Based on the product's reputation within the US market, we had Canadian customers request that we expand our UL compliance to include Canada." The UL recognized component mark is rarely seen by the customer, but is often part of a larger end-product that is UL Listed by the fire alarm system supplier. For an end-product to be UL Listed, the product is tested by UL to determine if it meets the requirements established by UL's published Standards of Safety. A UL recognized component has already been evaluated and tested in accordance with UL's component safety standards, streamlining the qualification process for the end-product. By having the fire alarm system supplier specifying a Contemporary Controls' EIS Ethernet switch to be used within the system, the supplier is not required to perform additional testing on this component. Several fire alarm and security firms have already specified the EIS series as part of their system thereby improving their time-to-market. The C-UL-US Component Recognition Mark required additional testing and evaluation from UL, but Contemporary Controls has several products with UL marks and is familiar with the process. Components that bear the UL Recognized Component mark are separately covered under UL's Follow-Up Surveillance program to ensure continued compliance and prevent unpleasant surprises when an end-product is inspected. "Our customers can be confident that as a trusted supplier we won't compromise their UL Listing." said George Karones. 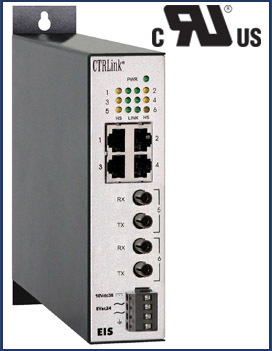 The EIS series is available in an eight-port 10/100 Mbps copper model, and three six-port copper/two-port fiber models. All copper ports auto-negotiate data rate and duplex while fiber ports are fixed at 100 Mbps and full-duplex. Multimode fiber port connectors can be either ST or SC while the single-mode version is equipped with SC connectors. All units require a 24 VAC/VDC power source, and can be DIN-rail or panel mounted. To aid troubleshooting, the EIS series incorporates LED indicators for data rate, activity, link integrity and power. All models carry the C-UL-US Component Recognition Mark for UL 864. Visit the EIS product page to learn more.